Ruairi has worked with a diverse range of organisations and clients to offer bespoke drumming workshop experiences that are both fun and productive. 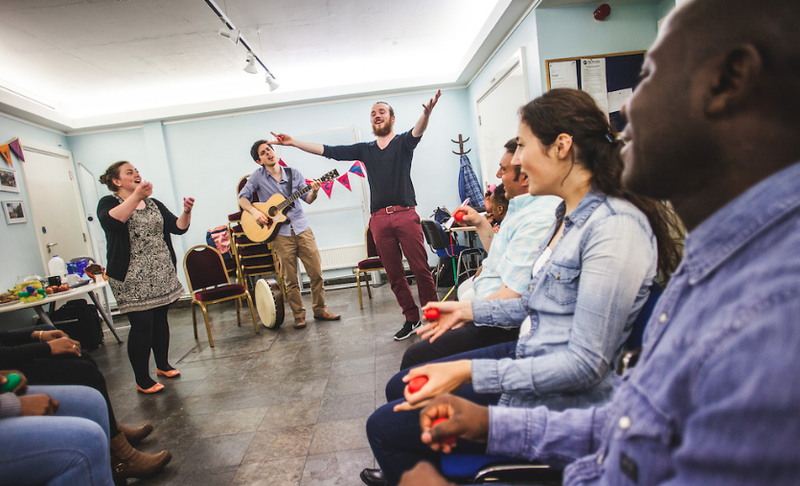 Music is conducive to creating an inclusive culture in the workplace and inspiring employees to connect, create and collaborate through focussing on real life experience and reflecting on relationships using analogies drawn from the musical process. Through focusing on empowering participants and building confidence quickly, Ruairi's workshops breakdown the barriers restricting teams and individuals resulting in a happy, healthy, wealthy and empowered workforce. Workshops are bespoke and designed to meet client needs and Ruairi has delivered programmes in schools, prisons, hospitals, care centres, museums, hotels, universities, orchestras and for organisations such as Disney, EMI, Virgin, Sony and Paramount Pictures. Creative drumming sessions are an ideal way to empower your workforce, develop teams or break the ice as a conference activity and brings people together in a way incomparable to anything else... you just have to experience it! There is something about getting the drums out and having a play which brings something positive out in people.... a sense of confidence, an openness to connect and contribute to the people around them and their community. Group drumming is a fantastic way to overcome obstacles. Rhythm is a universal language that is accessible to all and in the right hands can be a powerful tool for bringing people together and boosting individual and shared sense of awareness. Employee engagement and happiness is rightly one of the topics du jour for modern management and the future of work and drumming is the ideal way to boost morale and empower teams. An increasing number of developmental and neuro-imaging studies show that rhythmical activities such as drumming can have hugely positive impact on primal brain structures that influence the 'stress response'. This means drumming is a proven means to helping people regulate their emotions, reduce anxiety, and reduce stress levels whilst increasing a sense of connection and wellbeing. Moreover, drumming promotes synchronous brain activity, where left and right sides of the brain are stimulated at the same time and is clinicaly proven to produce a deeper sense of self awareness. Ruairi has contributed to numerous research projects at the Royal College of Music, Roehampton University and was recently featured on BBC's 'How to Stay Young' alongside Dr Chris Van Tulleken. Inspiring confidence and self belief is key to developing effective leaders in the workforce and Ruairi's leadership workshops are a fun, fast paced and effective way of exploring roles within social groups, and how to find your voice as an effective and authentic leader. Instruments are optional in workshops around this theme as participants are encouraged to use their voices and bodies practically to communicate and express themselves authentically. Participants will explore creativity, character, and risk taking through various musical activities in a safe and open environment. Ruairi's sessions on leadership are fresh and uplifting and offer a unique perspective on interpersonal dynamics.